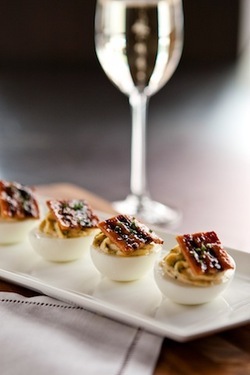 Blackened, deviled Glaum Ranch eggs at Press Club; photo by Aubrie Pick. Chef Chris Borges of Taste Catering is partnering with ~PRESS CLUB~ and helping to expand the menu. New additions include small bites like blackened, deviled Glaum Ranch organic eggs served with caramelized Hobb’s bacon, and fried Castelvetrano olives stuffed with eggplant purée, plus local duck and pinot noir sausage with Anson Mills farro verde and Heirloom Organics baby kale. The beer and wine program was extended last month, now amped up with more than 60 wines from around the world and 27 beers. Check out the menu and pairings here. 20 Yerba Buena Lane between Market and Mission Streets, 415-744-5000. The Inside Scoop announced chef Robert Leva has left ~SALT HOUSE~ after five-plus years there, and will be opening his own restaurant. Taking his place is Vernon Morales, who has been at ~TOWN HALL~ since 2009; he’ll be making changes to the menu in a month or so. Taking Morales’ place is his second-in-command Max Hosey, who has been working with Morales at Town Hall. Up in Pt. Reyes Station, chef-owner Christian Caiazzo of ~OSTERIA STELLINA~ has brought on Brian Bowen as chef de cuisine.